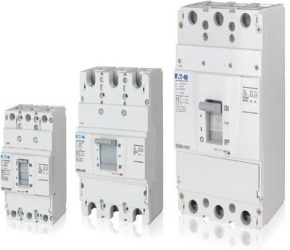 Eaton’s BZM Series MCCB offers basic protection for electrical designers, panel-builders, contractors and machine builders up to 400A and 50kA. Simple to operate with high quality features and accessories, the BZM offers most value for installations downstream in the power distribution network. The optional built-in box terminal BT version saves time and eliminates costs for additional parts needed for cable terminations. Unbeatable when it comes to saving space, regardless of whether they are used for energy sub-distribution or as a protection for incoming power in residential or functional buildings. Easy to handle: BZM’s narrow width saves space in the panel. Either a simple connection with cable lugs, or equally simple and convenient - box terminal solution which saves the cost of cable lugs, terminal accessories and wiring time. Reliable quality protects people and assets against short circuits and overload, with the BZM series being designed for the 16 to 400 A range in sub-distribution. Fully compliant with the IEC/EN 60947-2 standards and pollution degree III (IEC/EN 60947). BZM offers 5 switching levels from 15kA to 50kA in just 3 frame sizes up to 400A, offering selected 1 / 2 / 3 and 4 pole options, for all typical installation configurations. A wide range of common electrical accessories just snap into position under the front cover, saving valuable mounting and installation time. Standard voltage releases and auxiliary contacts cover all 3 frame sizes, minimizing type varieties, simplifying ordering and reducing multiple stock levels.